I am an avid gamer, I love playing video games and when the PS4 launched I spent 10 hours in line at Power City in Fonthill to get one because I had not preordered it at the time and only had the cash to splash out at the last minute. The PS4 and the XBox One are fantastic pieces of hardware, the power that developers have at their finger tips now is yielding stunning results. Fifa 15, PES 2015, The Last Of Us, Watchdogs, GTA V…just some examples of great games to hit the shelves over the past few months. With fantastic hardware, there is an expectation of the standard to what we are spending are money on and with next gen games being priced at the highest point that the market has seen before (€70 on average for a game) we are right to have certain expectations. 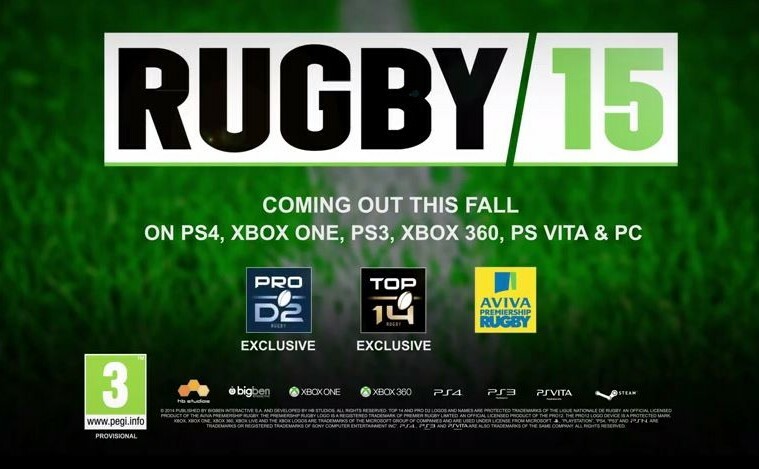 Earlier in the week I was browsing the PSN store and noticed a title that had slipped under my radar, Rugby 15. I am a big rugby fan, I love watching it and I had played Rugby Challenge on the PS3 which was enjoyable enough at the time to hook me in for a bit. Nothing fantastic as such however still fun to play. With that in mind I knew that I would have to give this game a go and decided to download it from the store. Unfortunately for us rugby fans all that awaits us is sheer disappointment. There is sadly nothing positive I can say about this game, I downloaded it last night at around 4pm and the next morning it has been deleted from my PS4. Visually the game is on par with what you would expect from a PS3, and a poorly produced PS3 game at that. The graphics are poor quality, the audio is mono tonal which comes as a hard shock given that one of the key ‘features’ of most sports games on next gen at the moment is that their crowds are now truly alive. The crowd in Rugby 15 sounds like they are half dead, the visuals are choppy and very rough round the edges. However anyone who plays sports games knows how key the gameplay is to success. So despite all these flaws so far, as long as the gameplay hits the mark then that is the main thing, right? Well sadly the gameplay falls well short of what a next gen game should be, the controls are easy enough to pick up however the animations are choppy, rough and anything but fluid. The ball also has a tendency to do things in the air that I have never seen in a real rugby match before never mind the video game. The rucking animations are okay, nothing to shout about as such however what really lets the rucking down in the game is the constant penalties and yellow cards in the ruck for no apparent reason had me stumped. The kicking animations are not great, it doesn’t look natural, the kicker looks pretty stiff before and during the kick itself. Cutscenes don’t exist in the game so there is no sense of atmosphere build up which is kind of key to sports games. Sadly there is nothing positive to say about this video game, everything about it is negative and as a rugby fan I can’t tell you how disappointing it is. If you posed these problems to one of the video game developers they would no doubt tell you that it is the first step on the ladder or that Rome wasn’t built in a day and you know what? They are right, however this is so far from what a first step should be it is somewhat insulting to lovers of the sport. If the game was on PSN for €20-€30 then things would be different, because the game is worth €30 tops. However the game is retailing at €60 and I will be honest it feels kind of sickening to know I spent that much on it. So we are expected to pay full price for a game that feels like it is not even half finished. It is without doubt the worst game I have played on the PS4 so far and I can’t actually think of a game that is more disappointing on the PS3. I hate trashing video games of products, I really hate doing it. However at the same time I have to pass on my advice, it feels somewhat of an obligation. So spend your money elsewhere, don’t buy this game. It is a shining example of how not to produce a video game for next gen and at the moment it is averaging 2 stars in the reviews which is pretty generous. Hopefully next year we will get something that truly represents a next gen rugby game.